If you have ever tried to tie a pair of shoelaces that have been iced over after a day in the snow, you have undoubtedly cursed the age at which you transitioned from a Velcro closure system. Traditional laces, sheesh… such an inconvenience. Fortunately for us, Klim has taken this issue to task. 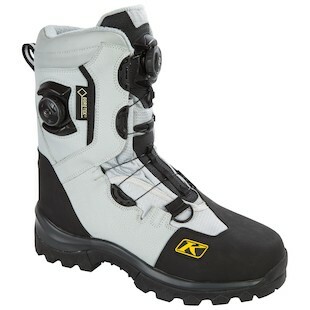 With the new Klim Adrenaline GTX BOA Boots, the laces are no more. With the same overall fitment as the original Klim Adrenaline GTX Boot, the introduction of the BOA lacing system is an extremely convenient and effective way of tightening your boots evenly and precisely. At the same time, they are easy to get out of at the end of the day as they utilize a quick-release function that keeps you from fumbling around and chipping away at frozen shoelaces. The advancement of the lacing system, however, does not come at a cost to any of the other widely touted features of the original. With 600 grams of 3M Thinsulate insulation for optimum warmth within the Gore-Tex membrane, you can be assured that the insulation will remain dry. You will also enjoy a removable, moisture-wicking perforated insole, extremely durable high-grip outsole, and specialized toe piece for resistance against wear from tunnel bolts. Putting on and taking off your boots should not be a hassle. To limit frustration and increase your comfort, adaptability, and overall time on the sled, check out the new Klim Adrenaline GTX BOA Boots.